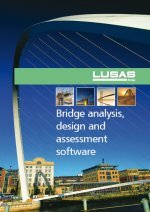 Northumberland County Council Technical Services Consultancy designed one of the first integral bridges in the UK with the help of LUSAS Bridge analysis. The North Shotton overbridge, on the A1 Trunk Road, 5 miles south of Morpeth in Northumberland was designed on behalf of the Highways Agency using recommendations contained in a draft version of the design standard which was later issued as BA & BD 57. As built the structure has no movement joints. 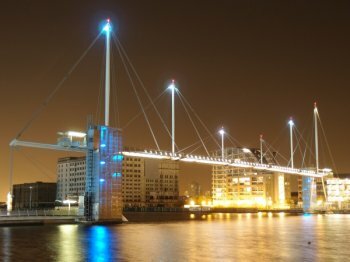 The two span continuous bridge deck is supported on a central pier with both bank seats supported on steel H piles. 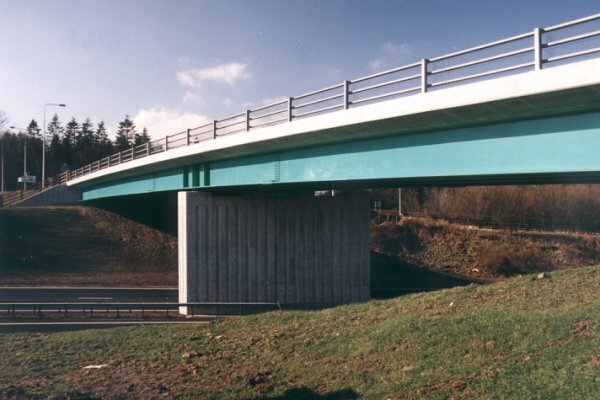 The deck is of composite construction with 4 steel plate girders and a reinforced concrete deck, both forming a curved vertical profile which follows the vertical alignment of the carriageway being carried. Abutments are of reinforced concrete with steel piles and deck girders embedded in the bank seats transmitting end fixing moments from the deck into the piles. Thermal deck movements are accommodated by soil structure interaction between the piles and the surrounding strata, resulting in flexure of the piles about their weak axis of bending. 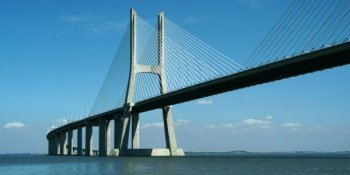 Analysis was carried out using LUSAS Bridge to determine global effects. The analysis model incorporated in plane effects due to the restraint afforded by the steel H piles as well as out of plane flexure. The final model incorporated 264 shell elements to represent the reinforced concrete deck and 238 3D beam elements to model the main girders, cantilevered edge stiffening beams, abutment diaphragms and the steel H piles. The model was restrained by vertical spring supports at the central pier. Soil structure interaction was modelled using horizontal spring restraints down the length of the piles which were rigidly restrained at the base. To simplify analyses such as this, LUSAS Bridge allows for spring supports for soil/structure interaction problems to be defined in terms of a force per unit area. This is then automatically assembled into equivalent springs over a surface and applied to the model.